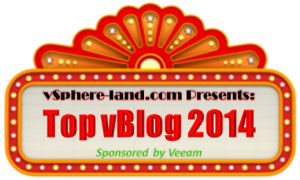 Every year Eric Siebert creates a list of all the great virtualisation blogs that are created and constantly updated. This event allows the community to vote for the best blogs out there. As you can imagine running one of these blogs takes time and plenty of effort to make sure the content is relevant. So now that you’ve arrived at my site and reading this blog post why not vote for me using the link below.